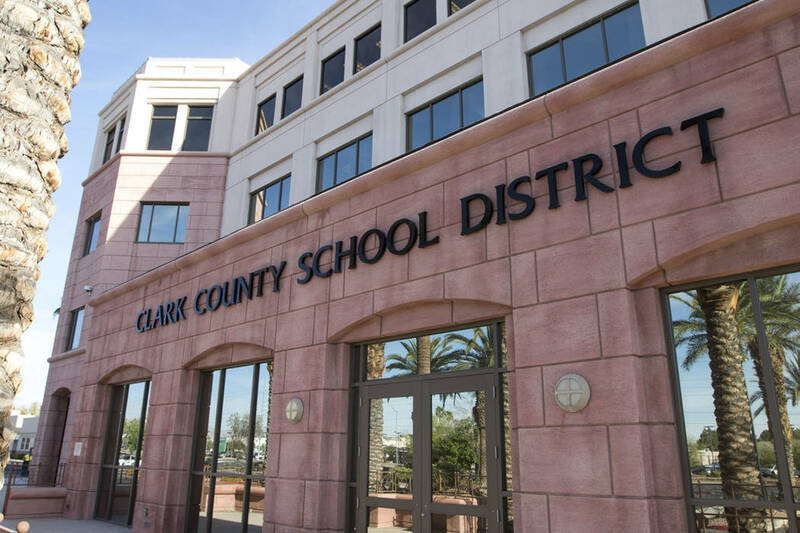 Now that the depth of the Clark County School District’s financial problem has become clear and layoffs are in the air, it’s continuing to spend on outside expertise or services. 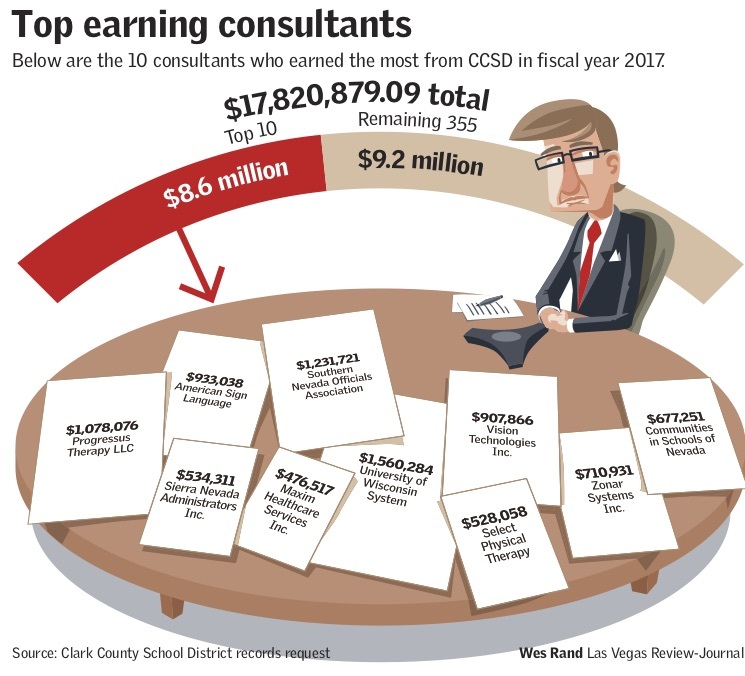 Last fiscal year, before the reality of its budget deficit hit, the Clark County School District spent more than $17 million on consultants. Now that the depth of its financial problem has become clear and layoffs are in the air, it’s continuing to spend on outside expertise or services. The services that money paid for in fiscal 2017 were varied, including more than $24,000 for speakers at events and nearly $100,000 for a character development program optional for schools. At least three of the consulting contracts totaling $17.8 million that the district awarded were with current or former district administrators or their companies, a Las Vegas Review-Journal analysis of public records found. Those services ranged from professional development to land appraisal, even to “clinicians” for mariachi bands. — $1.2 million to the Southern Nevada Officials Association for officiating at athletic games. — $16,500 to the Center for Teaching Excellence for a speaker at the new teacher kickoff. — $8,100 to the National School Public Relations Association for a speaker at the district’s back-to-school kickoff. — $238,500 to the Public Education Foundation for professional development. The district is continuing to spend on the outside services this fiscal year, even as it grapples with a $50 million to $60 million deficit. The total so far: $3.4 million. Some expenses are paid from the general fund, but others may be paid for through other means — grant funds or other department budgets, such as human resources. Many experts say consultants are necessary when school district’s staff doesn’t have the time or expertise to perform a specific task. Some services, such as dental work and psychotherapy, have a direct impact on students. But in the midst of a deficit, public scrutiny on any outside expenses has heightened. “We need to take a look at that very hard,” said Trustee Kevin Child, who has sought information about the cost and necessity of consultants. The University of Wisconsin earned the highest amount as an outside consultant to the district, receiving $1.5 million to administer the state-required “WIDA” test. The test is mandatory for English language learners. Progressus Therapy, LLC, the second-highest paid consultant, is an occupational and physical therapy provider selected through a request for proposal process in fiscal year 2015, district spokeswoman Kirsten Searer said in a statement. The company provides assessment and therapy for students, including special education students and athletes. Some consultants who scored work were former or current administrators. Billie Rayford, a retired associate superintendent, was paid $88,091 to serve as the district’s interim chief student services officer. That position oversees multiple divisions within the district, including assessment, curriculum and education services. Although the interim position has since been filled, Rayford continues “helping with leadership transition” this year and overseeing areas that pertain to the federal Title IX and Title VI laws in student services and also is serving as interim director of equity and diversity, Searer said. Rayford, whose contract ends in December, has earned $9,402 so far this year on an hourly basis. Searer, the district’s chief communications, marketing and strategy officer, was herself a consultant to the district. She earned $22,400 last year assisting with communications and strategy at a time when the district had neither a chief communications officer nor a communications director. She also earned an additional $6,600 as a consultant this fiscal year after being hired by the district, money she said was for services rendered as a consultant that she was not paid for on time. Karlene McCormick-Lee, a retired associate superintendent, also has worked as a contractor under her Newleef, LLC educational consulting company. She was paid $18,000 in fiscal year 2017 for project management services. District officials blame the current deficit on a number of factors that affected the district’s fiscal 2017 and 2018 budgets. The district maintains that those fiscal impacts were unanticipated and happened at the end of fiscal year 2017. State law requires school districts to submit biannual reports to the Interim Finance Committee listing hired consultants, the purpose for which they were hired and the amount paid. Consultant spending has arisen as an issue in the past: As it dealt with budget cuts topping $100 million in 2009, the district paid more than $14 million to consultants and speakers. But McCormick-Lee, who also worked around that time as a consultant and has filled a number of roles for the district over the years, argued that her experience makes her a valuable asset. She said she does not see being a district retiree and a consultant as a conflict of interest. Michael Casserly, executive director of the Council of the Great City Schools, said school districts typically hire former employees as consultants for their expertise. The council, of which the Clark County School District is a member, is a coalition of the nation’s largest 68 school systems. But Child, who repeatedly has asked district officials for more financial details on the outside hiring, said the district must ensure that every consultant is needed.